I will say again how lovely a resort SSR is – we would love to come back here in the future. All resorts have an area with a small television and chairs for kids – big and small – to watch Disney cartoons. At Saratoga Springs the area was adorned with drawings of Disney horses which I thought was very cool! Leaving our luggage safely behind with Bell Services, we drove to Disney’s Contemporary Resort for brunch. I think the brunch at California Grill was still fairly new at this point, so we were lucky to grab an ADR for it. We enjoyed it so much, we booked to do it again on our 2017 trip too. I am pretty sure we received complimentary Valet Parking, so we left our car with the Valet and went inside the hotel. 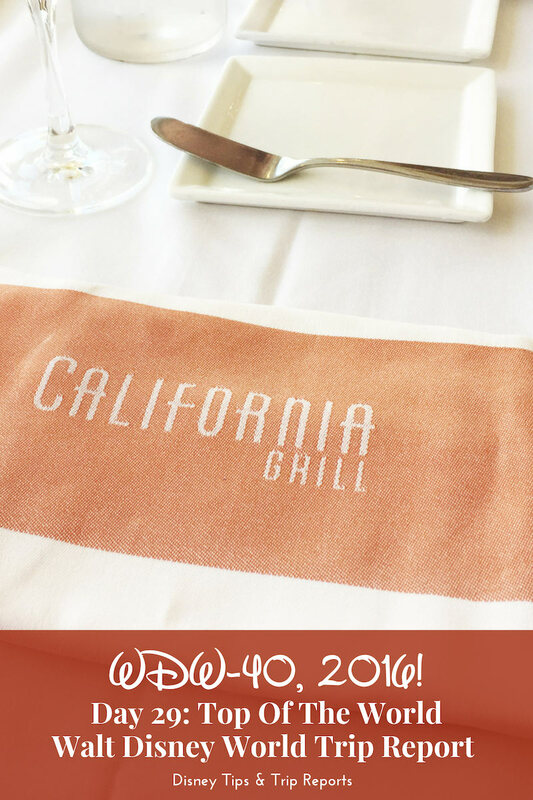 We took an elevator up to the second floor to check-in, and were then taken up in the private elevator to 15th floor where California Grill is located – it feels like the top of the World up here! We have dined here a few times now, but have never been all this way up during the day. The view was just AMAZING! Sadly my photos came out blurry and rubbish, but I’m going to have to share them anyway. Someone also lost a balloon – I always feel so sad when I see a Disney balloon drifting up into the sky – mainly because I know how expensive those bad boys are! Of course you can still see the view at night, all lit up and magical, but during the day it’s pretty breathtaking. I did a timelapse video of the view – pretty cool to see all the Disney Transport in action from up high! Since the Sunday Brunch is all we did today (other than go to the airport and fly home, but you know…) you’re going to get ALL the food pics I took! By this point I was over it with my DSLR, it was starting to annoy me that I couldn’t focus the lens properly, so I just used my iPhone to take all the food photos. With that out of the way, onto the brunch at California Grill! We were greeted with a complimentary Mimosa – which is essentially champagne and orange juice. Why is it not a Buck’s Fizz? I’ll tell you! A Buck’s Fizz has 2 parts bubbly to 1 part OJ, while a Mimosa is equal measure. The more you know! The restaurant wasn’t overly busy which was nice, and with the live musicians playing piano and double bass, it made for a relaxing time – which is perfect for brunch! We were shown to our table – not quite in the window, but close enough to have a view – and then our server came over and introduced themselves to us. He explained that Sunday Brunch is part buffet (all-you-care-to-enjoy) and part table service. Essentially your starters are from the buffet, you are then brought out an entree, and finally a platter of pastries and sweets. The Mimosas are included (you can get Faux-Mosa – without the alcohol – too) in the price which is $80 per adult. You can order cocktails and wine by the glass, and there is also a Bloody Mary Bar (priced extra). Oops, nearly forgot about the coffee which is also served. The Bloody Mary Bar, was impressive. More like a glassful of brunch in itself judging by this sneaky snap I managed to get of another guest’s cocktail! Along with your choice of vodka and hot sauce you can also choose from a selection (5) of condiments which included huge shrimp, pickled vegetables, cheese, olives, bacon, and chorizo, all skewered and stuck into a celery stick.